Good work fella, and super clean car How did you get your tailpipes to tuck up so neatly to the bumper? Mine's got quite a big gap! I need to address that. That is a common thing with cheapy polydrive bits I'm afraid. I bought mine from the dealer. You can pretty much guarantee VW tools are man enough for the job That bolt is an absolute swine. It's tightening torque isn't much, but the breakaway torque is huge because of the friction of the stupid bolt shoulder they used. I recommend you have a pal push hard onto the breaker bar whilst you crack it off. The tool bit recess is also very shallow, so you can quickly find yourself on a one way flight to stripped out island if you're not careful. Cheers mate much appreciated . I'm OCD with how the car sits and looks prob much like yourself and like you it used to do my head in with it being too "saggy" for my liking...long story short when I fitted the BCS DP etc I had my mates ramp all night so messed about with it for hours till it sat right...the BCS let me angle the back box slightly up keeping the good angle....new rubbers help as well obv. You also on standard BB? Yeah I had someone push and centre the bit when I tried to remove it as the laser bit is too long and a shoddy fit I knew to keep pressure on it...just utter garbage like you said. My long time friend from school works in VW so I get cheap parts and access to tools usually but he's in OZ and the guy that runs the parts department is a bit of a loser sometimes. Got the part coming from another VW ...I will be doing this another time now got all the parts there and my phase difference is about -1Kw so I'm ok with it for now. Tensioner and guides look/feel ok but still want it done. Funnily enough I'm doing it on a S3 tomorrow night who's phase diff is -5Kw sounds a bit like a diesel. Interested to see/hear the difference after it's done. I had no trouble at all doing the chain job, but I put that down to using VW tools, including the cam lock plate. The latter is expensive for one time use, but worth it for the peace of mind! Oh, I forgot to say when checking the cam phase angle, disconnect the VVT solenoid first, otherwise it will adjust and not give a true reading. -5KW does sound like he needs a new chain though! Lol cheers mate aye I stuck on new rubbers at the same time and made sure all the hangers were in the original position and not corroded or bent. I managed to get the oem locking tool from another mate and I got the oem bit from VW Germany for 12 euros so happy days...and yup we also took the reading with the valve disconnected ... My mates S3 we done sounds much better after we changed the chain and tensioner. His S3 chain was "saggy" lol. Mine was spot on and the old tensioner and chain were pretty decent. I changed both I wldnt bother just changing a tensioner without the chain tbh makes sense to do both at the same time for anyone going to do this. For anybody going to do this with a wide reading like my mates S3 (his was -5Kw) it sounded a bit like a diesel then once changed it dropped it down to -1Kw and sounds much much better not diesel like....just normal TFSI which aren't the quietest anyway tbh. Cldnt get it to zero but phase pulley could cause that.......thats a little expensive for anybody wanting to change it btw approx £300. I need a new pic sharing app apart from photobucket as I can't get it to work now...any suggestions? Thanks mate much appreciated . I'm sure you'rs will be ok bud as you know it's a 2 sec check with your vcds with the valve disconnected. You still happy with your TTE420? Feeling good with the slightly colder climate now? This last week it has been raining since Monday night. I have to drive carefully since my track tyres aren't that good on wet roads. Next week I should be able to test better the performance of the new IC. While on track I'd only get high IAT at the end of the long straight, they would reduce to more reasonable temperatures doing the next corners. I'm not running that much boost with the TTE420. Doing some runs with Dragy should tell me if my car is a bit faster now with the new IC and with a colder climate. Finally getting this to work kind of. Printout of my results after my visit to R-Tech. Apologies for the stupid photobucket logo I dont know how to remove it. My own review of my R-Tech map. Now I had just done the RFD and intake valve clean 2 days before I went down for this map and the car was feeling great, the reason I went to R-Tech was for a couple of reasons mainly I wanted it custom mapped to my liking though. Nicky done an amazing job with the car. He removed the RFD fault codes so they wouldnt return and also mapped it out so it doesnt run roughish at idle when cold...tbh mine didnt really do this anyway but I wanted it perfected as much as possible. Also my APR 2+ map was crazy aggresive and I would break traction constantly in the wet....even trying to feather the throttle was difficult with the APR map in wet conditions it was either on or off kinda feeling. I always run mich PS4s so no cheapo on the tyre side of things. APR map wasnt the most fuel efficient either. Now the linear throttle/boost I wasnt sure about tbh BEFORE I went down and the mapped traction control I didnt really care about or put much thought into since if im going quick or on track it gets switched off instantly anyway...HOWEVER after getting this adjusted also day to day driving it does make a big difference the car is much more usable as it doesnt come in as harsh or immediate which it did with the APR map which is handy at junctions or any normal pulling away scenario it does make the car a much more usable machine now....again mainly in the wet if your attempting to move a bit sharp. 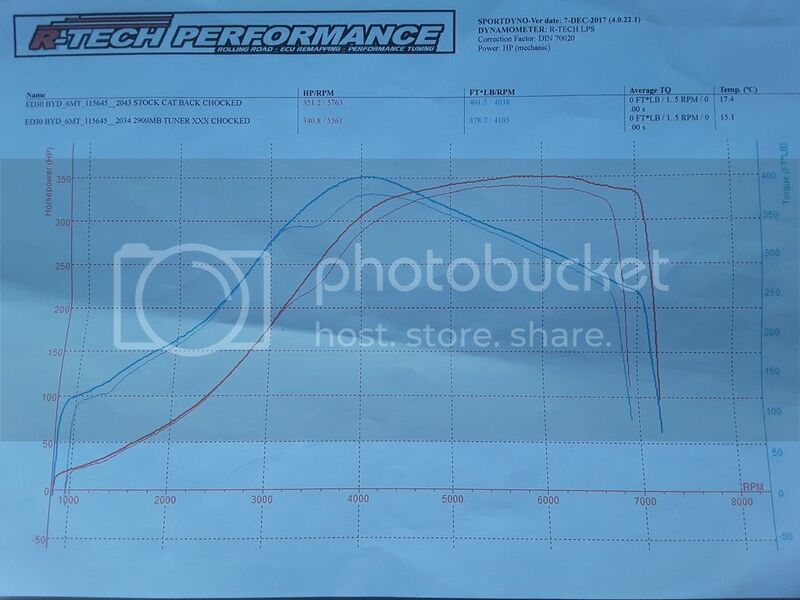 Linear throttle /boost does make the car drive completely different and at first I was like hmmm...BUT its the bum dyno that throws you as when you actually do compare to the way the car was driving before its much much quicker...the fact i can get traction earlier and keep it down a bit more the car motors like fck. Plus I went againt my mate from works RS3 and lol what a difference. I dont drive the car every day now but have been using it a lot after this as it has become much more usable and the power stays wayyy longer.. I dont rag the car ever and never hit the limiter (Or anywhere near it tbh) but Nicky did say it could be used right up to the limiter now which would get the most from it.....fck aye does it!! I gave it an ehh controlled run on a closed off road we will say to see what it could do as i kept looking at the map and thght fck it im giving it a go.....now to be clear I never do this as im not a 20 year old idiot anymore but i had to see what it could do. Car pulls constantly strong to the limiter and keeps up with my colleague from works RS3...to an insane top speed btw. After driving it now for a week or so I love the R-Tech map...doesnt feel as aggresive but is wayyyyy quicker overall I cant stress that enough. Im not slating these maps/companies as I have been happy with my APR 2+ up until this point however the car is quicker more efficient and my LTFTs are back down to approx 2% which is amazing...My APR map was over 10% albeit I did have slight air leak which i sorted before hand. I drove 6 hours each way for this and i feel it was worth it so if you live near R-Tech or even in England and only a couple hours away I would highly suggest going to them. I agree, there's no point going in there and just changing the tensioner! Check your phase angle again in 6 months or so. Mine was also -1KW after new parts, but it drifted to -3KW after a few thousand miles. It hasn't affected the performance or noise though. You can never get it bang on 0KW due to the designed-in chain link 'hunting'. It's always slightly off on purpose to make sure the chain link and sprocket tooth wear is even, hence why you need to turn the engine about 50 times to get the copper links to line up again! +3KW to -3KW is in the TDC dwell zone, so nothing to worry about, plus as you say, the VVT phaser will tweak things as necessary. Nice R-Tech review, good to read you're happy, must've been a little apprehensive changing maps. Will be taking mine there eventually. Going to get my handling sorted first then take it there for walnut blast, DSG & engine map. I’m not sure if the ring lands of the CDL are stronger or not. The pistons of the CDL are different from the pistons of the BYD/BWJ/BHZ but I’ve seen more cases online of CDL engines with broken ring lands. From what I’ve read Niki Gower write most should be due to faulty injectors or a not safe map. I’m not sure how much mine has at the moment but I’ll be happy with 370 lbft. A FWD car doesn’t need a lot of low rpm torque. If it keeps pulling to red line, it’ll be fast. Cheers mate I wasnt sure about the linear throttle map before hand but it makes such a massive difference to the usability of the car its night and day mainly in the wet (how long did you drive with the linear map and was it custom or revo cos i genuinly cannot see past it now? ), like i said the APR was far too aggressive and didnt give you enough wiggle room before spinning up the wheels which is useless in wet weather conditions where as this map has much more torque which is usable and can be utilised much more efficiciently without having to sacrifice the power. I was going down the Wavetrack route before this but im saving the cash now for other things tbh....not that it compares to a diff but it has made sucha usable difference I can hold off a while longer. I have a standard back box but i do have the VWR intake so it doesnt feel as choked as it did on the standard intake tbh and the noise is controllable...not a fan of open intakes. I agree about the coilovers, I dont run ohlins but I do run H&R V2s which are height and dampening adjust...not too bad defo do the trick and not some cheapish APs or anything...quite fancy Ohlins just cant justify it now due to how much ive already sunk into the car over the years...if it was 3 years ago and they went lower I probably wld have tbh love the idea of them but they are probs a 3rd the price of the car now lol. Im getting deployed all over the place these days so its hard to get a good stint with the car its a shame hence why I do a lot(maintenance/mods) in a oner whenever I can...was considering the tte420 but probably pointless with standard BB and its all the extra bits needed to get it running...mainly LPFP etc. Ive got the RS4 valve fitted already but apparently u really need the 165 bar valve and Im not sticking a TTRS pump in as the fuel level being wrong wld do my head in and the only one I wld consider wld be the APR solution which is a bit expensive but wld be my only option. Cheers mate just my own personal view on it. I was happy with the APR 2+ map but it over fueled a lot and was too aggressive on the throttle for ideal control in the wet. Wasnt sure about linear mapping but can say it makes massive a difference...it didnt appeal to me before hand I will admit but its night and day. I dont know what it would be like in a DSG as mine is manual so I would try asking someone on here that has an R-Tech map with DSG to see what they think but I dont think you can go wrong with Nicky mapping your car fully custom so more efficient staright away and you can set the limits to whatever you want...I didnt go crazy and asked him not to chase numbers. The TC mapping is decent for daily driving in the wet but tbh I still switch it off if im wanting to go for it at any point as its still too intrusive and its still too severe after my initial review of it I will be honest....definitly better than it was tho if your someone that will never switch it off. Lovely car and interesting thread! What did you use to clean the valves?